Posted on July 3, 2018 at 10:41 am. In the spirit of the colors of the season, we’re taking a look at a few of the artist’s prolific (and super colorful) works over the course of his career. The Open Window, Matisse, 1905. Image c/o Liberty Puzzles. 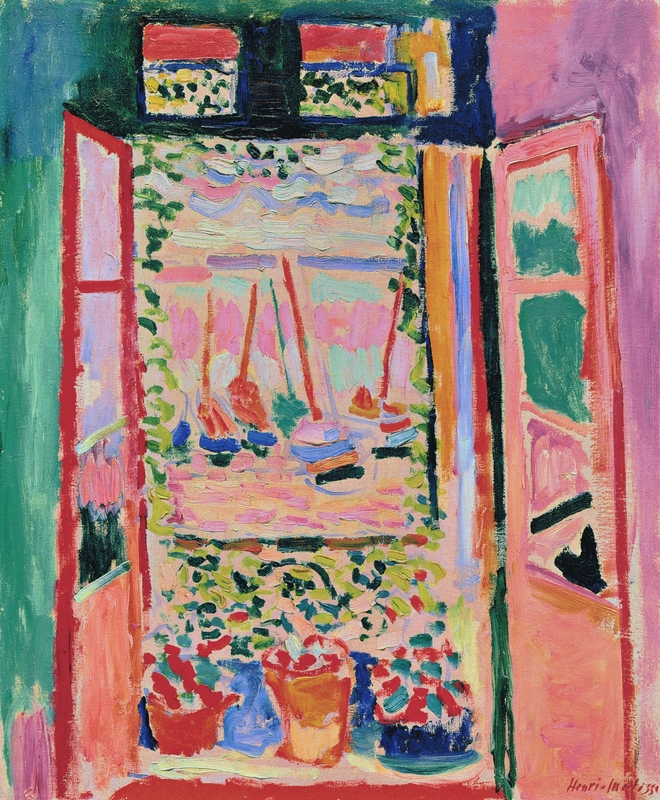 One of Matisse’s earlier works, The Open Window is a perfect example of what the art movement called Fauvism is known for: bright colors and thick lines, which work together here to create a move towards more abstract forms. With all the color play, Matisse has created a world we’d love to enter—his take on the harbor at Collioure on the Mediterranean in the south of France—on any given day at all; especially on a warm day like today. Harmony in Red (The Dessert), Matisse, 1908. Image c/o henrimatisse.org. 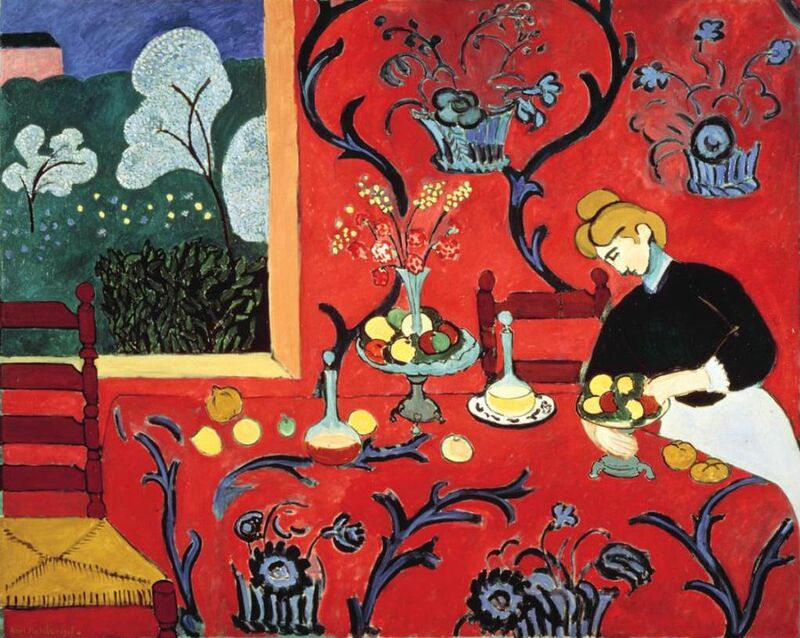 Matisse explores a single color in Harmony in Red. Expanding on scenes from earlier works like the 1896-97 Dinner Table, he goes above and beyond, experimenting with color and pattern. The brocade from the tablecloth takes over the room, creating an imaginative scene miles apart from a simple dinner table study. It’s balanced by the deep blues and greens seen in what might be a window or a painting on the wall. Either way, it’s a vivid depiction of both what color and pattern can do. 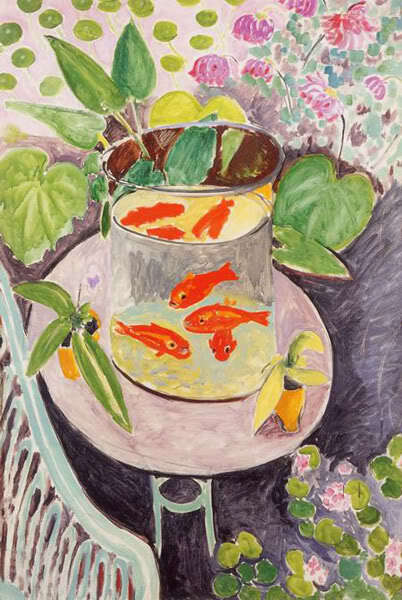 Still Life with Goldfish, Henri Matisse, 1911. Image c/o The Art Docent Program. Included in our first-grade curriculum, this still life is also a study in patterns, but with a much cooler effect. Florals and greens create a cool space surrounding the fish for a much more natural feel. It also shows the artist’s move towards more abstract work, a shift that continues throughout his career. 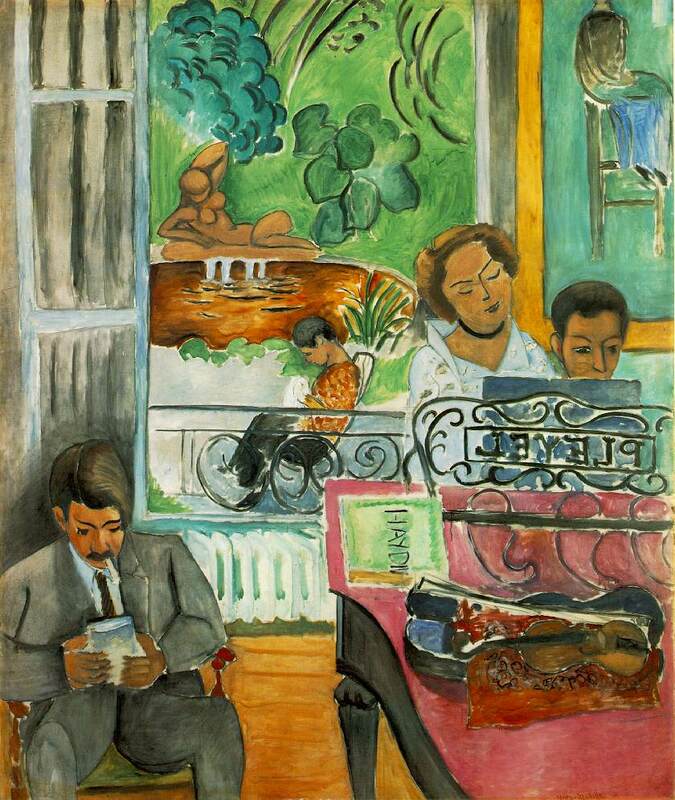 The Music Lesson, Matisse, 1917. Image c/o My Museum of Art blog. Though Matisse may have toned down his bright colors for a more tame palette in The Music Lesson, his experimentation with color never truly ends. The lush garden, featuring a statue that’s reminiscent of his paintings, distracts us from the interior, as we imagine it’d distract the young boy in the painting: who’d want to be practicing music on a day as beautiful as that? Seated Woman, Back Turned to the Open Window, Matisse, 1922. Image c/o http://art-matisse.com. We wish we were in this painting: just look at the seascape beyond! 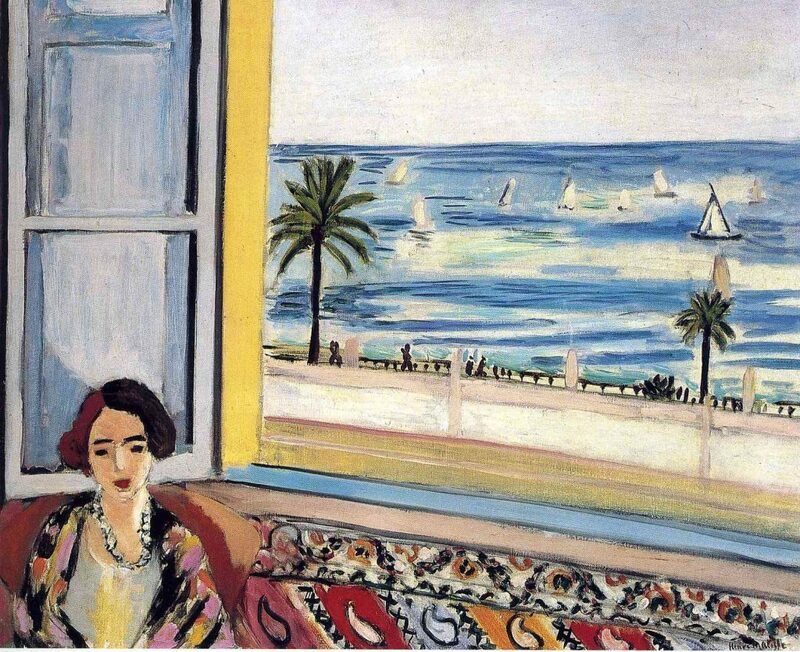 Again we find Matisse playing with pattern on the interior and contrasting it with the “outside world” in the painting. Beasts Of The Sea, Matisse, 1950. Image c/o The Art Docent Program. Featured in our fourth-grade curriculum, this piece not only makes us feel submerged through its exploration with abstracted forms. 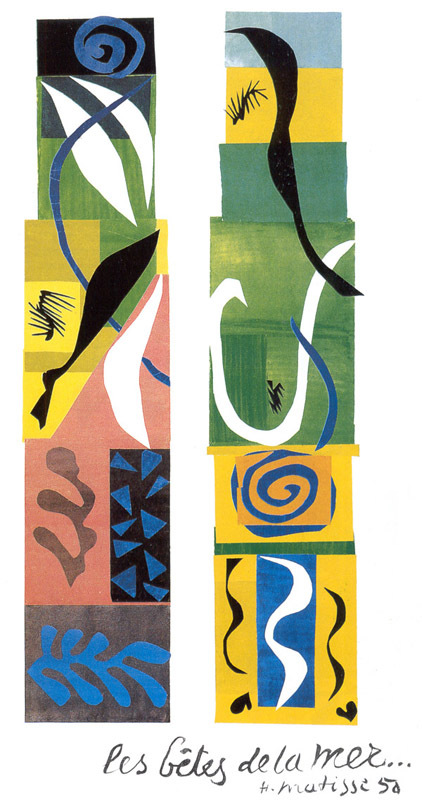 One of Matisse’s cutouts created later in life, the cool colors complement the abstract paper forms, creating an undersea world and showcasing Matisse’s mastery across mediums. Of course, these are only a few of Matisse’s many works that play with bright colors and shapes. What are some of your favorite works by Matisse? Share in the comments below! What do we do here at the Art Docent Program? Find out more about us and our curriculum here! Want more on art history? Check out our blog archives for more fun articles! Don’t forget to keep up with us on Facebook for all our latest updates!